What do you do when you decide to put a pool where you originally planned to install a solar power system and the roof won’t work? You get the determined folks at TRA Snow and Sun to help you think outside the box and create something we think is an innovative concept! That’s what contractors of the Bourne, Massachusetts home project did when they encountered this issue on the project being constructed in a beautiful wooded area with a steep hillside at the back of the property. Plymouth Solar Energy of Plymouth, Massachusetts was assigned the task of determining where to place the solar energy system during the construction of a large home. After making the site visit, Greg Aborn of Plymouth, determined that the terrain was unsuitable for a ground mount system. The soil was too sandy, unstable and steep. When the owners disclosed that they had now decided to build a retaining wall and put a pool, Greg began research into alternative solutions. This is how he discovered TRA Snow and Sun’s Awning Solution. TRA Snow and Sun has a reputation for creating engineered systems for solar mounting and roof snow retention systems and are very adept at thinking outside the box. They used all of their experience (25+ years) and resources on this project. The engineering and time spent was free. To install this solar panel system, they fabricated custom scaffolding which allowed the installers to stage the wall in sections while not disturbing the soil retention (special grass to hold the soil together) that the homeowners were required to plant in compliance with tight property set-backs. Erosion concerns with the abutting neighbor and steep property topography leading downhill were also factors in the installation. TRA’s mounting system, combined with creative problem solving, eventually overcame what seemed like insurmountable obstacles across an extremely complicated range of municipal regulations and restrictions. The finished product exceeded the homeowners expectations and created a solar power system that creates 12.3 KW of energy while conforming to the requirements of both local authorities and the homeowner. Energy savings no matter how you look at it! TRA has the solution. It’s called a solar shadow power awning system. There’s no shortage of motives why homeowners and business owners might pursue renewable power – decreasing your electricity bill, earning a point towards a green building certification, slashing your carbon footprint, or creating a public statement about your environmental commitment. Among the renewable energy options available, solar is perhaps the most comfortable, reliable and trusted. Solar power is a proven technology with consistent performance and a quantifiable payback on your ROI. Though rooftop solar mounting is most the common option, it isn’t always the best fit for small buildings. TRA Snow and Sun’s shadow power awning systems aim to provide professional installers with a simple, easy to install the mounting system for solar panels on any vertical structure. TRA Shadow Power Awning Mount System attached vertically to a business wall structure. When you have reduced availability of roof space, Shadow Power is ideal. With the increased knowledge and enforcement of fire codes and the associated reduced availability of roof space to mount solar panels, it has become necessary to find other options for mounting PV systems to buildings. One solution is a custom Shadow Power solar awning system. Non-vertical Solar Awnings generate more energy than flush mounted systems. Non-vertical awnings provide cooler cell temperatures due to ample air flow beneath the modules. Solar Awnings reduce energy use. Additionally, when mounted to the south and west sides of a building, the shade from the awning keeps the building cooler, effectively reducing air conditioning loads during long hot summer days. We can design your awning to work with a variety of application. Just give us your project details and we will design your Awning Mounting Solution to fit your project. TRA Snow and Sun’s shadow power awning systems aim to provide professional installers with a simple, easy to install mounting system for solar panels on any vertical structure. Reduced Availability of Roof Space. With the increased knowledge and enforcement of fire codes and the associated reduced availability of roof space to mount solar panels, it has become necessary to find other options for mounting PV systems to buildings. One solution is a custom shadow power solar awning system. Introducing TRA Snow and Sun’s Flat Roof Ballasted Solar Mounting System – This unique quick and easy Galvanized System can be scaled for a large flat roof module installation. By project design, it will allow a solar array to be tilt in place at a 5-40° angle on a flat roof. The solar ballast racking system is pre-designed with a fixed angle for your unique requesting project. This system highlights the quick and easy functionality by adding concrete blocks directly to ballast pans for flat roof mounting. The special extruded aluminum solar rail plus with our wire management system makes the installation an absolute breeze saving you time and labor cost. The PERFECT solution for solar installations that don’t want to penetrate either the roof or the ground! Our land powered Ballast mounts rely solely on the weight of the array, the racking system and additional material, like concrete pavers, to hold the array to the roof. Their greatest advantage is the lack of roof penetrations to the building. Keep in mind this doesn’t eliminate the want for operating with a roofing contractor, however it can drastically lessen the coordination required between the roof repairer and the PV installer. But in order to do so, the installation must be coordinated with the unique roof artisan or an approved representative for the roofing producer. Ballasted systems need to be carefully analyzed due to the roof load imposed by the system to preserve the roof warranty. https://trasnowandsun.com/wp-content/uploads/2016/11/Ballast-e1520026565622.jpg 127 230 Brandon Jensen https://trasnowandsun.com/wp-content/uploads/2015/05/tra-logo-final-with-slogan-3.png Brandon Jensen2016-11-07 17:11:312016-11-07 17:13:43Get Solar Attached "Raising the Roof"
Energy savings no mater how you look at it! TRA has the solution. It’s called a solar awning. Among the renewable energy options available, solar is perhaps the most comfortable, reliable and trusted. Its years on the market make it a proven technology with consistent performance and a quantifiable payback and return on investment. Though rooftop solar mounting is most the common option, it isn’t always the best fit for small buildings. TRA Snow and Sun’s Awing Solutions aim to provide professional installers with a simple, easy to install mounting system for solar panels on any vertical structure. TRA Solar Awning Mount System attached vertically to a business wall structure. Reduced Availability of Roof Space. With the increased knowledge and enforcement of fire codes and the associated reduced availability of roof space to mount solar panels, it has become necessary to find other options for mounting PV systems to buildings. One solution is a solar awning. We’re HERE at Booth 1071 Giving Away FREE Torque Wrenches! Join us at Solar Power International at the Las Vegas Convention Center in Las Vegas to receive a FREE Torque Wrench! Tuesday from 10 AM – 6 PM, Wednesday from 10 AM – 6 PM & Thursday from 10 AM – 4 PM. We’re excited to bring TRA Snow & Sun to SPI to demonstrate the new products and ideas we’re working on to deliver the best solar mounting possible. Come and see our new designed ballast system demonstrating the unique solar possibilities that will save you time and money. You will also enjoy learning about our new solar rail plus and flashing. Want more! We will provide the best learning experience in what our solar mounting products offer with our new touch and assemble solar demo kit! We know every project is unique and no one solution fits every application. That’s why we offer free engineered solutions specific for your project. You provide us the project details and we will take care of the rest. Contact us at: 877-290-8669.
https://trasnowandsun.com/wp-content/uploads/2016/07/SolarPowerInternationalLogo-425.344204501_std-e1520026234430.jpg 70 230 Brandon Jensen https://trasnowandsun.com/wp-content/uploads/2015/05/tra-logo-final-with-slogan-3.png Brandon Jensen2016-09-07 15:00:332018-09-05 19:59:22We're HERE at Booth 1071 Giving Away FREE Torque Wrenches! Join us at the Solar Power International at the Las Vegas Convention Center in Las Vegas! We will be there at Booth 1071. Stop by, meet some of our TRA team Tuesday from 10 AM – 6 PM, Wednesday from 10 AM – 6 PM & Thursday from 10 AM – 4 PM. See what to expect in 2016 Solar Power International. Plan to attend the fastest growing and largest solar show in North America as recognized by Trade Show Executive and Trade Show News Network. SPI has also been among the Gold 100 for seven years running and named “Stickiest Show Floor” by Trade Show Executive for the innovative ways in which attendees stay engaged. SPI is North America’s largest solar conference, boasting over 15,000 attendees, 600 exhibitors, top-notch industry-focused and technical education, and representation from leaders in the global solar market. SPI is the only trade show with the support of leading national solar organizations, Solar Energy Industries Association (SEIA) and Solar Electric Power Association (SEPA). SPI 2014 was also ranked #25 in Trade Show Executive’s Fastest 50 and is ranked #109 in the Top 250 Largest Trade Shows (by Trade Show News Network), making SPI the only solar show to make all three lists. For more information on Solar Power International 2016, please visit www.solarpowerinternational.com. Going solar can seem like a huge investment. And the truth of the matter, without all the different incentives with federal tax credits and state incentives, they can be. But if you’re considering going solar and thinking about the cost you should consider the yearly savings. Solar panels are not cheap and easy to install or otherwise, everyone would have them placed on their homes. A solar paneled flush mount system can cost about $5 per watt, that is $15,000 average to produce 3kW. But with all the incentives installing solar you’ll save from federal tax credits, state tax credits, and other local rebates. Don’t forget when going solar you will be saving money on the amount of energy you would use because you won’t be purchasing energy from your electric company. Electricity can be expensive in many states compared to other states, so solar would be a huge benefit to you if you live in a state that offers high prices and tax breaks. 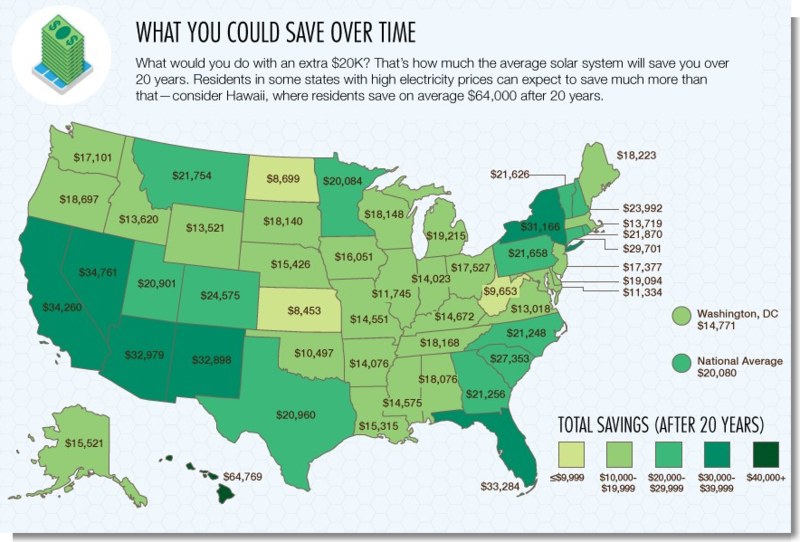 Financially solar will cost, but will save you money! Going solar is the way to go. How much can you save? In general, the estimated savings you could save on average would be $20,000 through the 20-year course! Here is a great link of an infographic that gives you an estimated breakdown of how much you could be saving in your actual state. Understand your potential saving where you live is the key. You may be thinking investing long-term on a home may be risky, but it is not. Getting to know the facts on your home appreciation with having solar panels installed. The short of the story is that solar mounting systems typically installed increase the value of your home! https://trasnowandsun.com/wp-content/uploads/2016/03/James-Rich-Residence-Solar-AWning-System-Solar-Efficiency-Solutions-6-300x225.jpg 225 300 Brandon Jensen https://trasnowandsun.com/wp-content/uploads/2015/05/tra-logo-final-with-slogan-3.png Brandon Jensen2016-04-20 16:07:302018-09-05 16:38:34How Much Can Solar Save You?